Do they look homosexual? I assume you mean the "stereotype" of homosexual men? You can not tell most gay guys from straight guys. I think the mens uggs are hot! I tried on a pair today as a matter of fact, and there were some other guys looking at them as well, I think becs of Tom Brady adverstising them. I would have bought them too, but the fit wasn't good. They either slipped off my foot, or I went down one size and my toe was too snug in the tip of the boot. 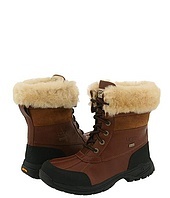 Yeah I wasn't aware people outside Australia wore ugg boots, lol. I used to wear em at home as a kid, but not out. They really warm the feet though. They are ugly, but they keep my feet warm and comfy. When the day comes where I'm more worried about what people think than keeping my feet (therefore my body) comfortable, then I will wear something else. These are the Uggs for men with fur exposed. They also sell a similar pair with no fur showing. Was the person talking about this type or the ones usually seen on women? I thought the op was speaking of the classic Uggs. I live in the midwest. Uggs are ugly, but my pretty feet stay warm. and there were some other guys looking at them as well, I think becs of Tom Brady adverstising them. .
Tom Brady could make a burlap sack and rain boots look attractive. Never the less, I don't see many men around here wearing them. I'd much rather see men in Uggs than the frequently committed fashion crime of socks with sandals. I don't mind them on women if they style it right, but definitely NOT FOR MEN. I don't own them and not planning on it. My boots need to have at least some kind of heel on them.